Sony SMP-N100 review | What Hi-Fi? Sony's first toe in in the streaming water comes in the shape of the Netbox SMP-N100. The Netbox delivers open-format media streaming as well as supplied online content from the company's new Qriocity service. Qriocity is rolling out across Bravia devices at the time of writing, and offers SD and HD movies to rent, with music to follow. With HD offerings such as Iron Man 2 and Inception already online, together with deals in place with major studios, it looks set to be a serious proposition. Prices are set at £3.99 for SD films and £4.99 for high-definition (matching iTunes). There's plenty more content besides, thanks to Bravia Internet Video. This provides access to BBC iPlayer, and apps for the likes of YouTube, Sky News, Facebook, LoveFilm and more, via a wired or wireless connection. You can also stream MKV, WMV, MPEG4 and DivX files, complete with high-definition audio codecs, from a PC – it's DLNA certified – or simply connect a hard disk via USB. Connectivity is thorough, with HDMI, component and a digital audio output, among others. Watching Iron Man 2 in HD streamed from Qriocity, colours are vivid and punchy, blacks are solid but detailed and there's plenty of body to the PCM audio. For streamed video, it's great. Apps such as iPlayer and YouTube are perfectly adequate, too. What's not to like? The box isn't as stable as the Apple TV, being slightly more prone to losing its network connection, while the XrossMediaBar isn't quite as intuitive or as fast as Apple TV. 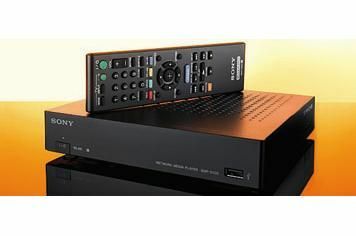 Plus, you can get all the N100's features – plus a Blu-ray transport (but minus wi-fi) – for not much more money in the shape of Sony's Award-winning BDP-S370. And sharing files over your network is more involved than it ought to be: the N100 may support a wide range of file types, but most will only run properly via its USB input, which rather defeats the point of owning a streamer. So, a worthy foil for Apple TV, then – not least if you want the freedom to add your own content and the ability to access iPlayer and other apps. It looks set to improve with updates, too.